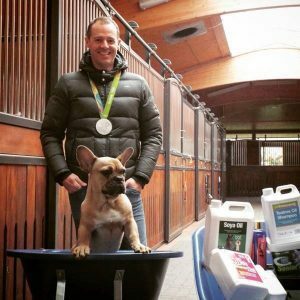 Spencer Wilton keeps Super Nova II (Neville), his Olympic medal winning dressage horse, in Reading, in the most exquisite yard you’ve ever dreamed of. The stunning indoor arena has full wooden beamed roof with length-long sky lights allowing perfect natural light onto the immaculately leveled surface which seem to span as far as the eye can see. The stables look like they were built for royalty with rich brown wood and polished black detailing, with not a blade of hay or speck of bedding out of place. Yet with such as intensely well kept place, the yard has such an air of calm about it, to such an extent that Neville was taking his routine morning nap as I walked by his stable. Anyone that watched him at Rio Olympics would have appreciated the immense power and energy behind the movements within his dressage test, the sensitivity to react to the subtle aids and the highly refined energy transferred into scope and expression to apparently glide across the arena. It came quite a surprise to see him so relaxed, but maybe I shouldn’t have been surprised as Spencer and his groom, Claire, convey the same relaxed and calm approach whilst not missing a single detail in looking after such amazing horses and a beautiful yard. It was lovely to see such relaxed and happy horses, and if I was going to humanise him, it’s nice to see that the fame of an Olympic medal hasn’t gone to Neville’s head! Whilst Neville was enjoying his little snooze, we brought the wheelbarrows through to the yard and were straight away loaded with bags of Saracen feed and NAF products (Saracen and NAF are two of Spencer’s very select few sponsors). Even Percy, Spencer’s adorable puppy, jumped into the wheelbarrow to have a ride around the yard and lap up the attention. Spencer and Claire commented on the light weight and ease of maneuverability of the wheelbarrows, and Percy seemed happy with the smooth ride too! Such an immaculate yard, unfortunately, doesn’t happen by magic. So the Wheelbarrows Direct wheelbarrows will be kept busy. 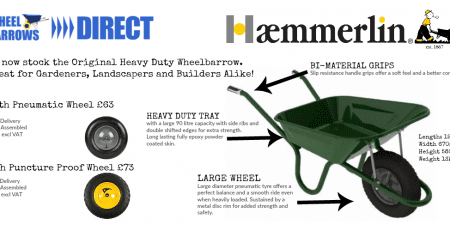 The quality of our wheelbarrows was commended by Spencer Wilton.